I just can’t get enough of this horizon…looking up at the La Sal Mountains. We found these petroglyphs out on Potash road, about 5 miles outside downtown Moab (sorry they’re a bit difficult to see). They date back to around 1600 AD, because the Spanish introduced horses to North American in the 16th century, so the images of horses in the Ute rock art didn’t appear until then. 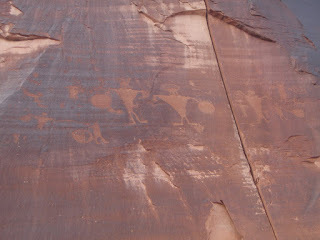 The Ute practiced a hunting/gathering lifestyle, so many of the images depict humans with shields, and bison and mountain goats. These pictograms date back even further, probably to around 2000 BC. 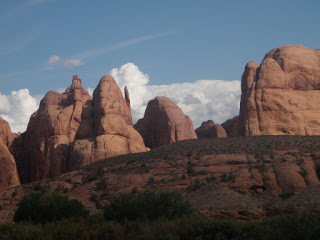 We found these about 45 minutes north of Moab in an area called Thomas Springs. 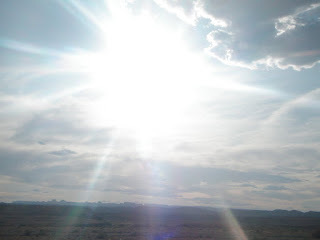 We had to drive through a ghost town, and down a long dirt road before finding them. But they were worth it! 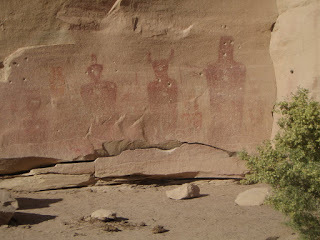 The images were more archaic and although slightly eerie in their alien-like depictions, it is speculated that these pictograms are more anthropomorphic. 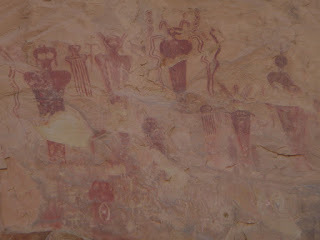 These pictograms were on a stone wall across the canyon from the ones above, and were not as naturally protected from the elements. Regardless, these drawings probably date back to around 2000 BC as well, and again may be depicting an anthropomorphic tale. The sun was brilliant as we drove back through the desert, and we experienced yet another breathtaking sunset only a couple hours after this picture was taken. We dined in Price at a quaint Italian restaurant, and finally arrived back home in Park City, only to fly back to Santa Barbara the next morning. I cannot wait to come back and explore more of this fantastic land! This is great, Carolyn! And I just finished another Native American book called "Black Elk Speaks." It was actually totally tragic, but maybe I should have expected that.